Stow Bedon is a useful reminder that a village and a parish are not the same thing. All England is divided into the parishes of the established Church: until the 19th century, civil parishes and church parishes were virtually identical. Most parishes have a single village in them which takes their name, but a significant minority do not, especially in East Anglia, and especially in central Norfolk, where many parishes contain nothing more than straggles of houses along lanes. Less commonly, a parish has more than one village centre: Stow Bedon has two clusters, about a mile apart, and this church is between them. It feels even lonelier than it looks on a map, partly because of the way the Breckland rolls away in all directions from the wide graveyard. There would, of course, be no point in a remote church like Stow Bedon unless it was kept open, and the parish obviously realise this, transforming what would otherwise have been a dying lock-up into a wayside shrine for pilgrims and strangers. This is especially good because St Botolph is not a remarkable church - or, at least, not for historical or architectural reasons. That it has survived at all is more cause for comment. Cautley, coming this way in the 1940s, reported that this terribly-treated church is rapidly falling into ruins. A German plane returning from the Midlands dropped its remaining bombs near this poor little church, completely wrecking it. 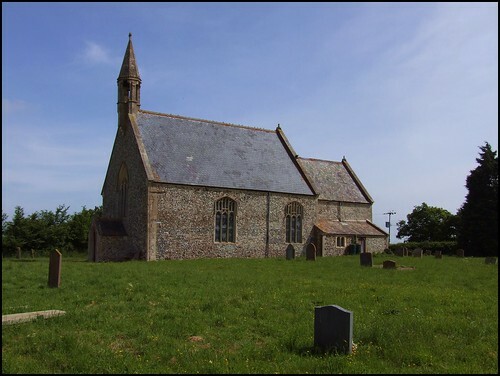 Perhaps it is surprising that it was restored to use, but we are right on the edge of the battle training area here, and perhaps the loss of four medieval churches to the British Army galvanised the Diocese into rescuing this one. The building had a chequered life even before this. The west tower fell in the 18th century, and in the 1850s this was one of the last-known churches to be restored by the largely pre-ecclesiological Norwich architect John Brown, much in the style of the 'Carpenter's Gothic' churches he had been building two decades earlier. The bell turret is rather perky, and below it a curious porch protects the 14th Century west doorway, which for many centuries must have served as the tower arch. The interior feels surprisingly large and barn-like, but even so the massive font comes as a surprise. In the plain nave only the royal arms provide a spot of colour, but this wide space is a perfect foil for the intimacy of the pretty little chancel, which is entirely 19th century except for the haunting survival of the medieval mensa stone on the wooden altar, a perfect detail.